High Street giant M&S reported a decrease in like-for-like revenue by 0.7% in Clothing & Home today in the company's half year results, also reporting 0% change in Clothing & Home revenue from October 1 to 2016 to September 30 2017. Full price sales increased by 5.3%. Revenues were adversely impacted by "the decision to reduce the number of clearance sales in the period from 4 to 2," the company said. However channels for the future suggests M&S expects online share of sales to grow "very significantly" with plans for a "digital first approach" where one third of the Clothing & Home sales will be online in the medium term. 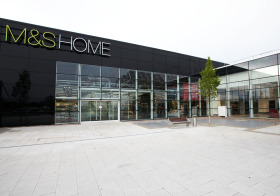 The group looks to emulate a faster approach to consumer shopping like other home retailers such as Argos and Habitat, promising "significant changes" in Food and Clothing & Home to create a "more commercial" M&S. "We will continue to modernise our supply chain which needs to be faster and lower cost than today. Our digital fulfilment capability, while currently operating well, will require further investment to enable more rapid growth online and help us match increasingly fast competitor fulfilment rates," the company reported. Chief Executive of M&S, Steve Rowe said: "We have made good progress in remedying the immediate and burning issues at M&S I outlined last year. In Clothing & Home early results are encouraging." udes acceleration of the UK Clothing & Home space rationalisation plan which sees plans to step up its overhaul, coming a year after it first announced that it would shut 30 of its larger UK stores, with a further 45 being downsized or converted to food-only, deciding to also close 53 loss-making international stores. It has so far completed six of the 30 announced UK closures. Overall profit before tax fell by 5.3% for the group, however Mr Rowe has plans in the pipeline to "make M&S special again."